Brazilian five-year-old Maria Victoria Reginato Cunha has been hanging on for dear life since she was just five months old. Every three weeks, she receives a blood transfusion. She takes medication every day to help decrease the amount of iron in her blood. Without it, she would not survive. The pre-schooler has a blood condition known as thalassemia in which the body does not produce enough red blood cells. Only about 700 people in her country have the condition. Thankfully, little Maria’s fight may be over soon. Set to receive an umbilical cord transplant from her five day old sibling, Maria Clara Reginato Cunha. Maria Clara is an exact match for her older sister. She is also completely free of the gene responsible for Maria Victoria’s disease. But little Maria Clara’s perfect match, disease-free DNA was not chosen by accident. Jenyce Reginato Carla and Eduardo Cunha Cunha spoke to more than 30 specialists before deciding to conceive Maria Clara through IVF. But this wasn’t just any IVF process. Maria Clara was carefully selected. She would be the first ever Brazilian IVF baby to be selected for genetic purposes alone. The lab technicians that helped the couple conceive her looked for an exact match for Maria Victoria. 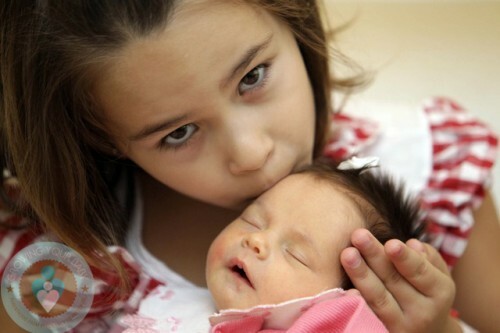 They also checked her DNA to ensure that she would not be born with the same condition as her older sister. It wasn’t until the couple’s second round of IVF that Maria Clara was found. Now that she’s here, her umbilical cord blood will be used to save the life of her older sibling. It’s always amazing seeing just how far modern medicine has come in its ability to save the lives of young children suffering from life-threatening conditions. We just hope that we don’t become so focused on advancing medicine that we forget how special and important each life is. We hope that little Maria Clara was conceived and received with the love she so deserves, not just for saving her sister’s life, but for being a part of this very unique family.